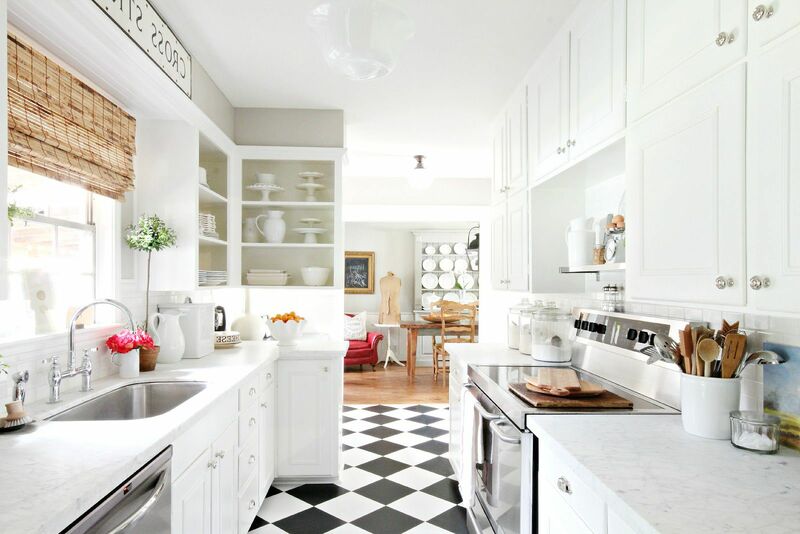 One of the most common color options for decorating a kitchen space is white and all its shades. 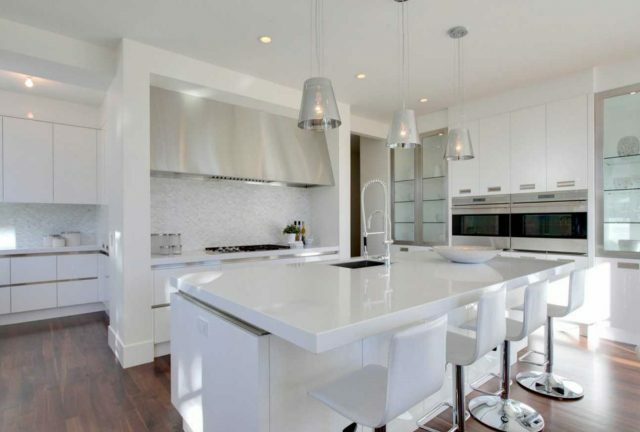 Built-in furniture and furnishings as well as accessories and decor items can be made in white tones. 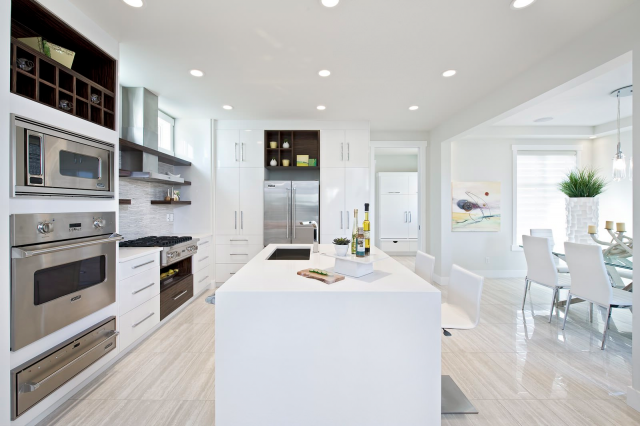 It’s not just because all light colors expand the space, they visually increase the area of a kitchen. 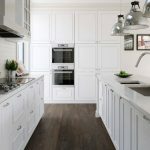 Any color solutions of built-in cupboard system, home appliances, textiles and kitchen items are perfectly combined with a snow-white finish color. 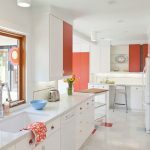 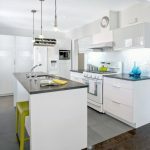 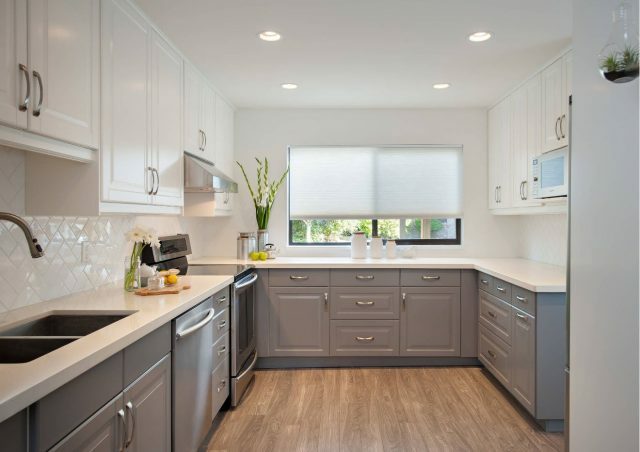 It is surprisingly much easier to take care of a room made in bright shades, especially if it comes to a kitchen – a place where cleaning takes place more frequently. 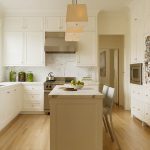 To avoid the impression of a snow-white, absolutely sterile room, causing associations with a medical ward or operating room, it is important to arrange some color and texture accents. 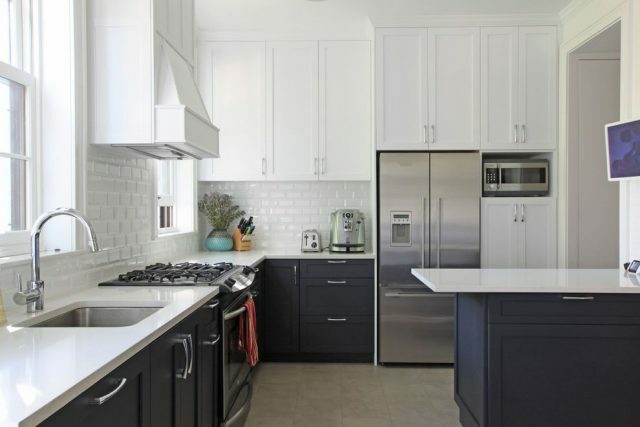 For this purpose you can use dark or bright tones, even a few strokes of excellent color shades will help to transform anexcessively light design of a kitchen. 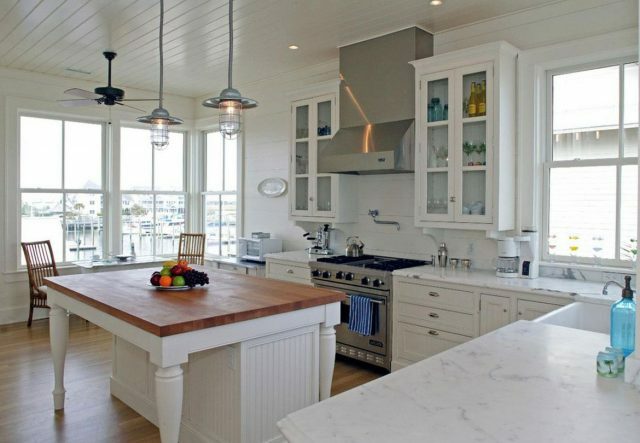 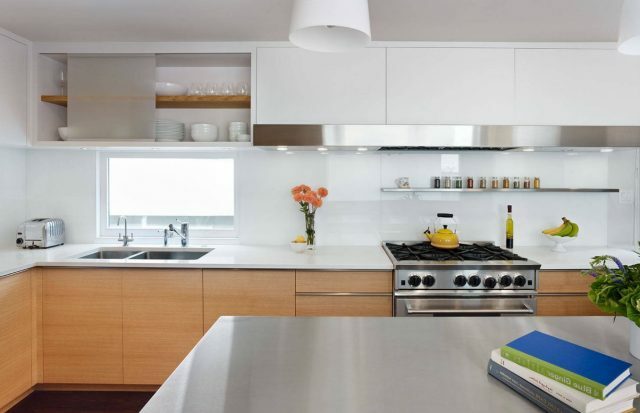 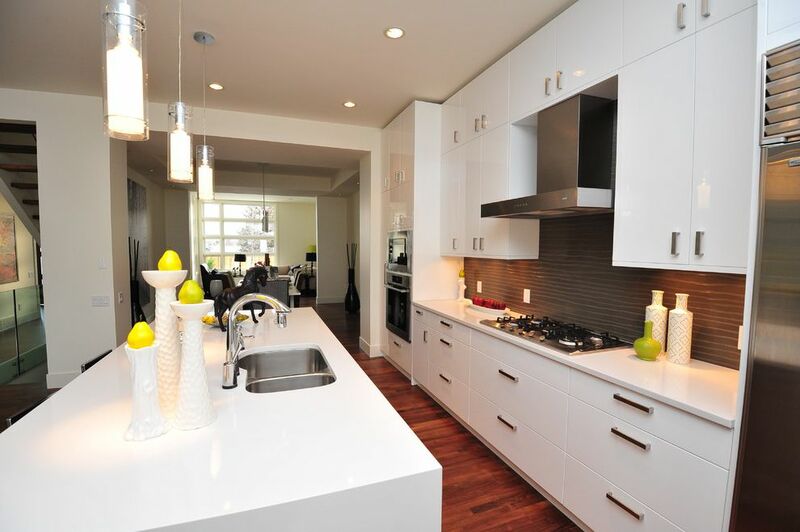 We bring to your notice an impressive collection of kitchen designs made in white colors. We hope that these inspirational snow-white interiors will help you to make a right solution for your own kitchen. 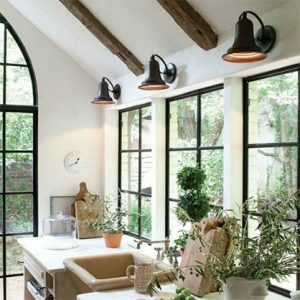 Light shades for walls and ceiling decoration create very fresh, spacious atmosphere of comfort. 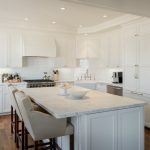 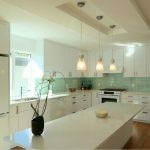 That is why many homeowners and designers prefer a white color and all its shades for lining or painting walls of a kitchen. 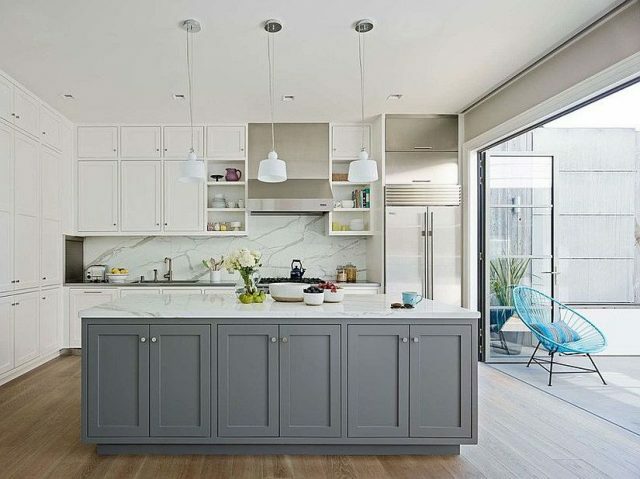 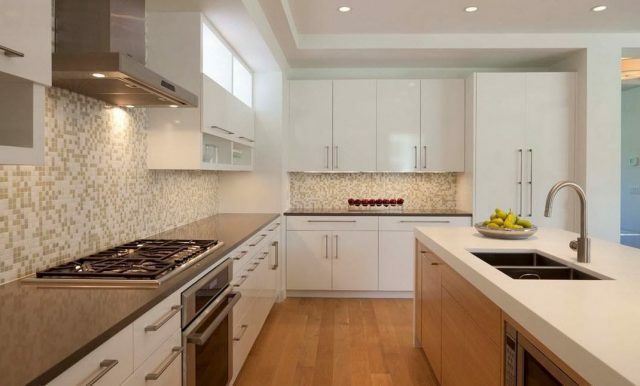 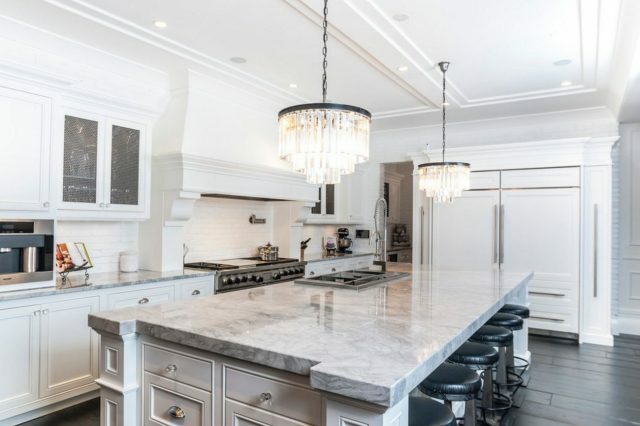 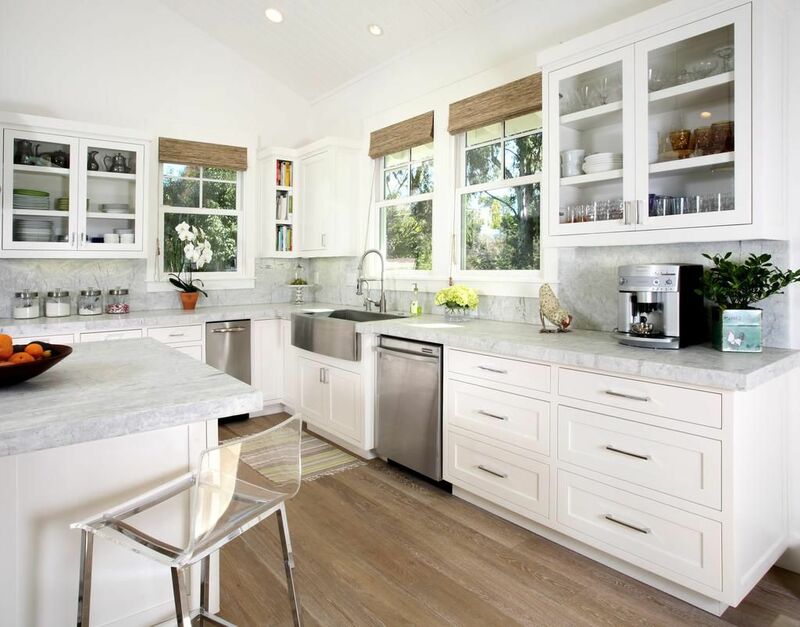 Snow-white decoration of walls and ceiling certainly needs some color emphasizing, if kitchen cabinets are also made in light colors, then you can bring color to the interior using lighting, stone or wooden countertops of working surfaces, as well as different accessories. 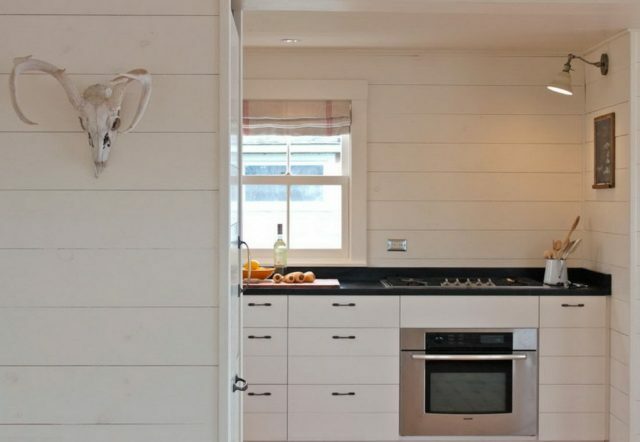 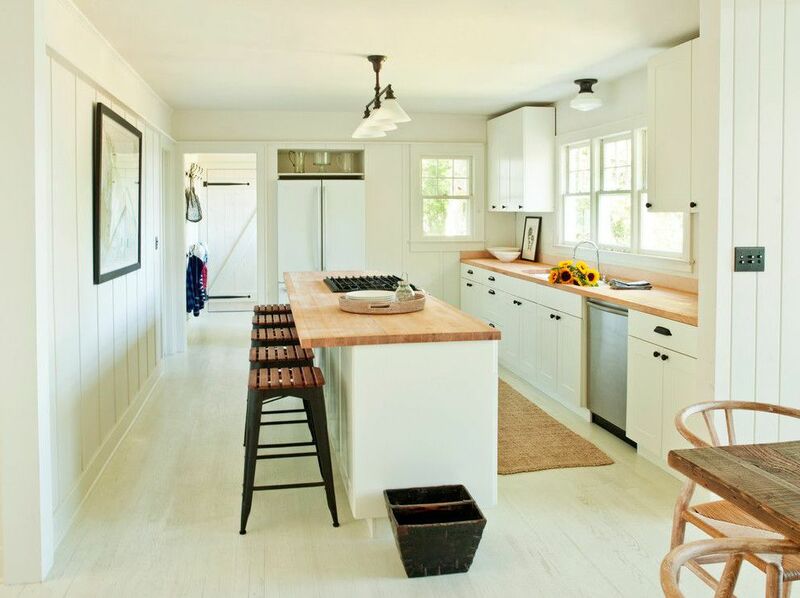 The ceiling decoration in the form of white painted wooden panels brings to modern kitchen interiors a sensation of relaxed country life with its homey coziness and comfort. 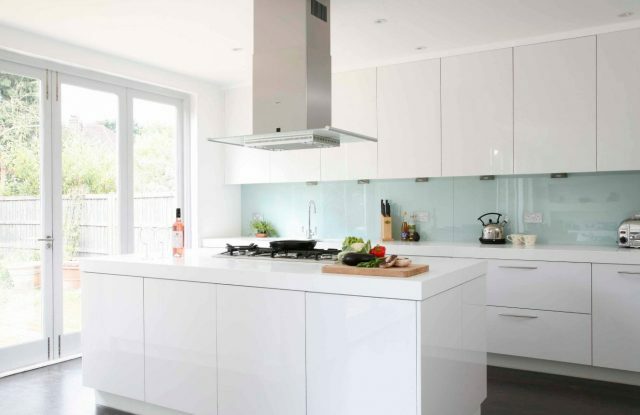 The “Metro” white tile is a traditional option for decorating splashbacks. 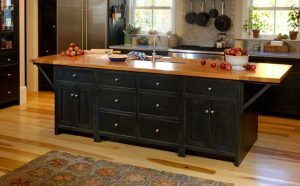 This is a beautiful, elegant and easy-to-care way to coat the surfaces near the working area, which is exposed to moisture and becomes dirty very quickly. 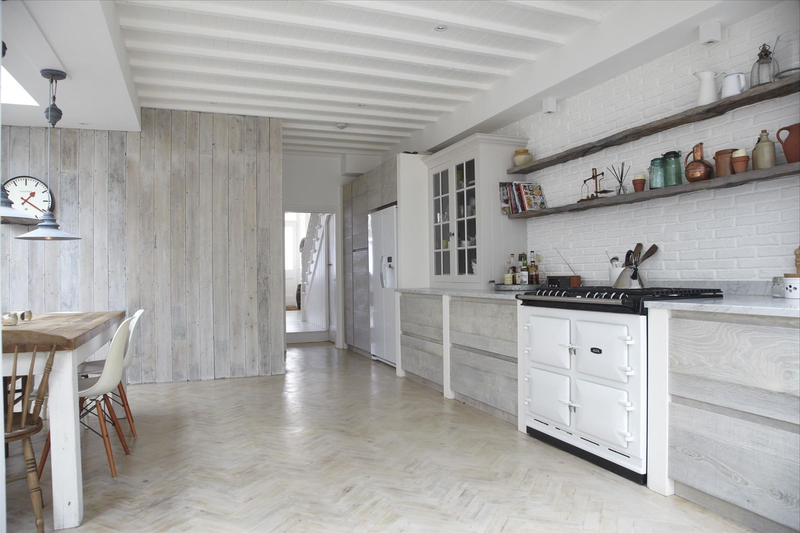 Some designers offer to makethe flooring in light shadesin addition to the snow-white decoration of walls and ceilings. Perfectly smooth, glossy floor is a practical option for visual expansion of space and a very modern solution for interior decoration. 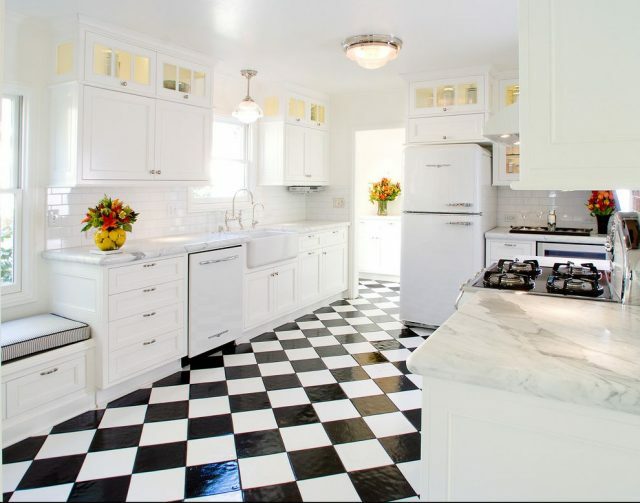 White floor tiles are also a good choice for a light kitchen interior. 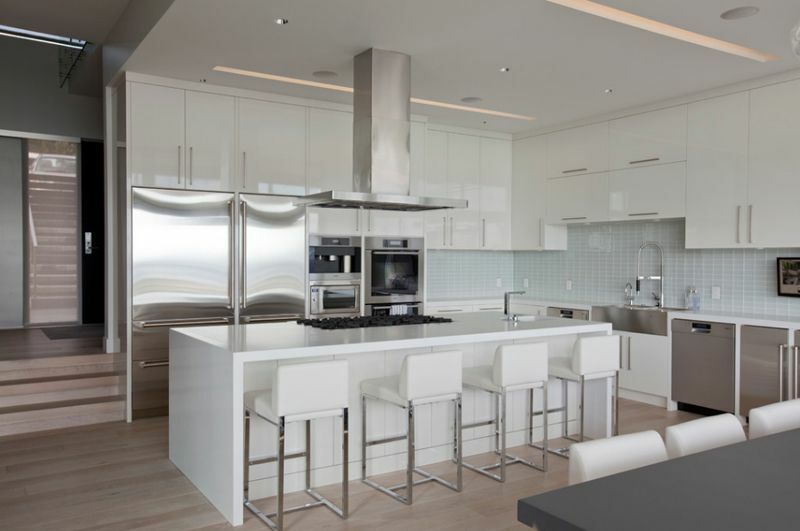 This design project looks almost futuristic due to the illumination of work surfaces and countertops with white, glossy kitchen cabinets on the background. Light blue plastic splashback and the finish on hood made in the same color have become the only distinguishing feature of this kitchen. 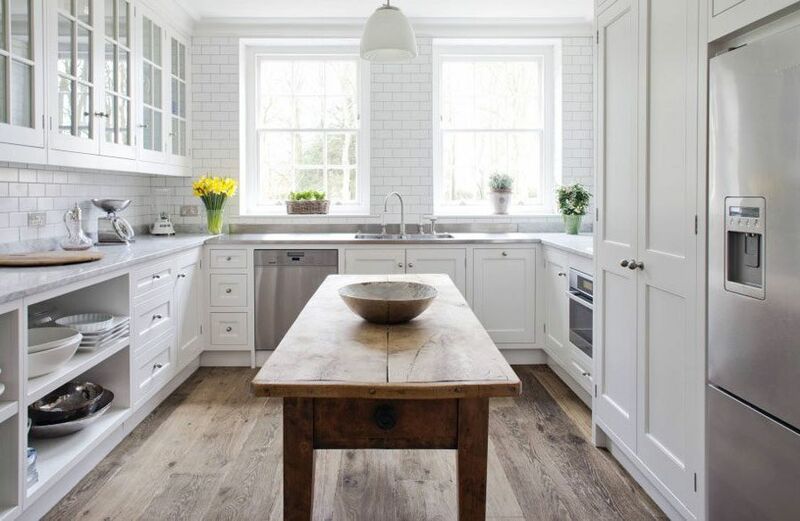 For floor covering you can use bleached wood, but choseonly a laminated flooring board, otherwise cleaning the floors will be the main cause of discontent of all members of your family. 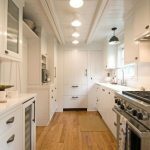 Contrary to popular belief, it’smuch easier to take care of the white colored kitchen storage systems than of dark-colored furniture. 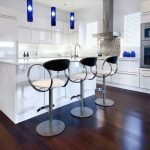 The same can be said about cabinet furniture, tables and chairs. 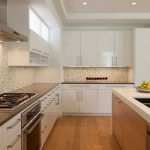 The most popular options for built-in system of kitchen cabinets are white, glossy surfaces without handles with systems of closers. 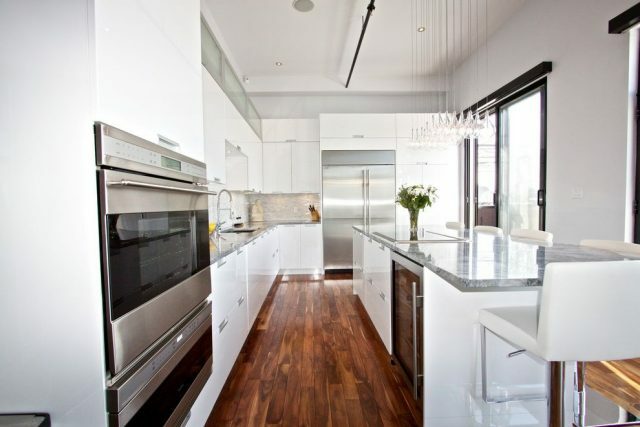 Such smooth surfaces are easy to clean, they usually do not leave traces of fingers and drops of water. 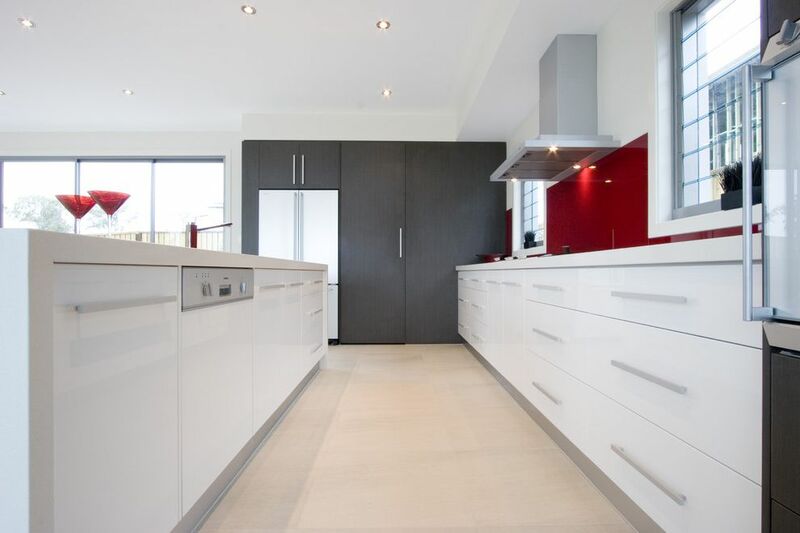 Choosing a floor-to-ceiling storage system, you maximize all the space provided and simplify the cleaning process. 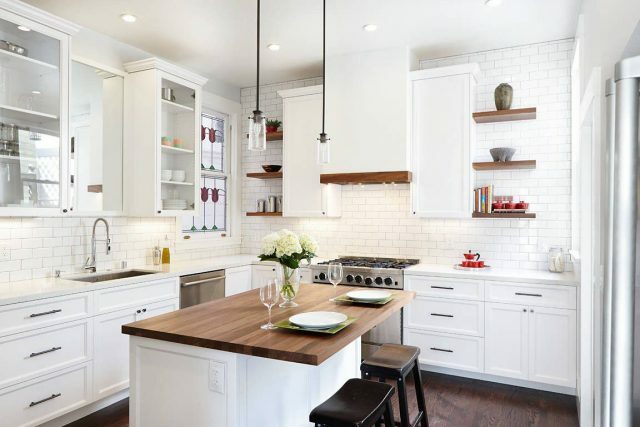 On the upper level of kitchencabinetsyou can store those objects, which are not used very often.If it is necessary use a small stand or stepladder. This is the more classical performance of kitchen cabinets made in white color. 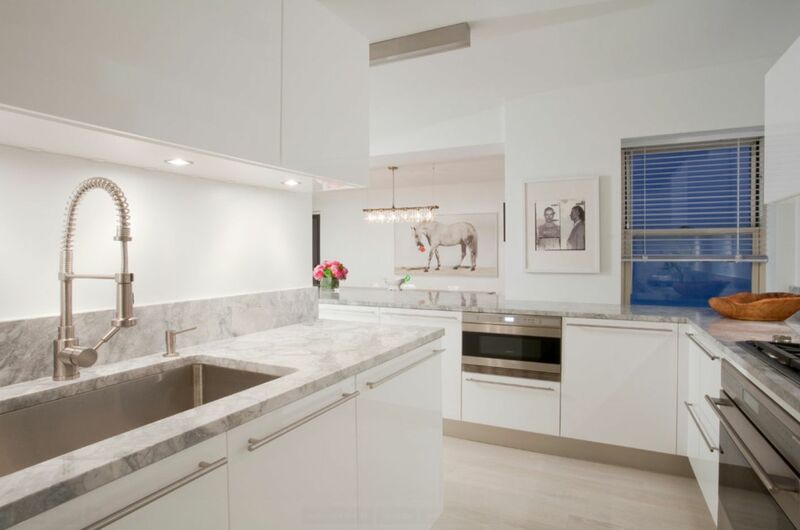 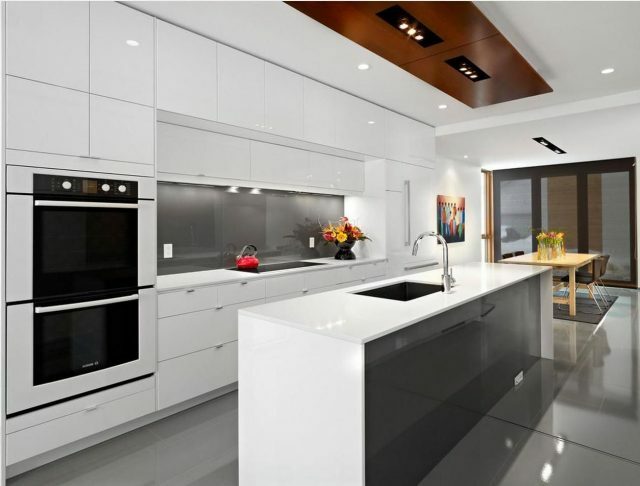 In combination with the marble splashback finishing, this interior looks chic. 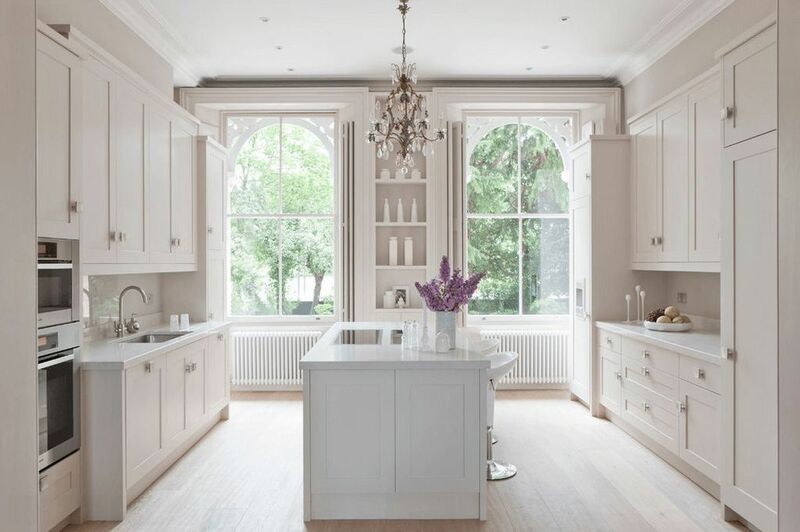 Another classic version of kitchen made in pastel purple shades. A spacious room with large windows looks luxurious. 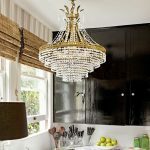 The royally chic chandelier with glass pendant elementsadds special charm to the kitchen. 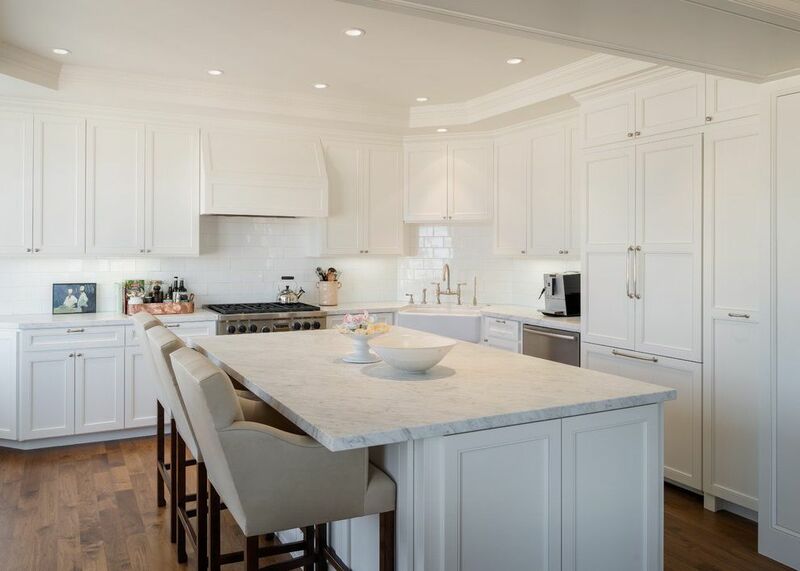 The snow-white decoration of window frames in this luxurious dining room has become a harmonious addition to the general atmosphere of freshness and comfort. 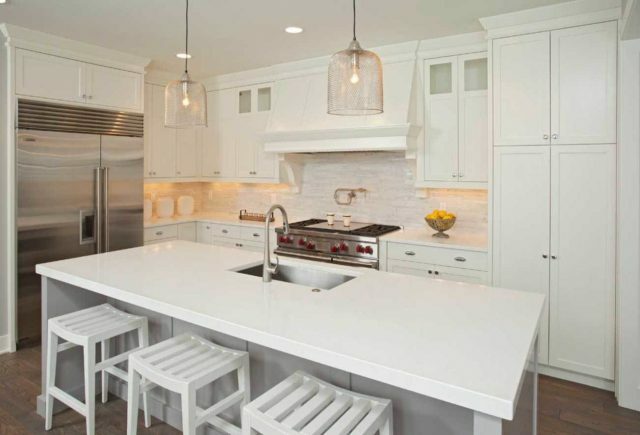 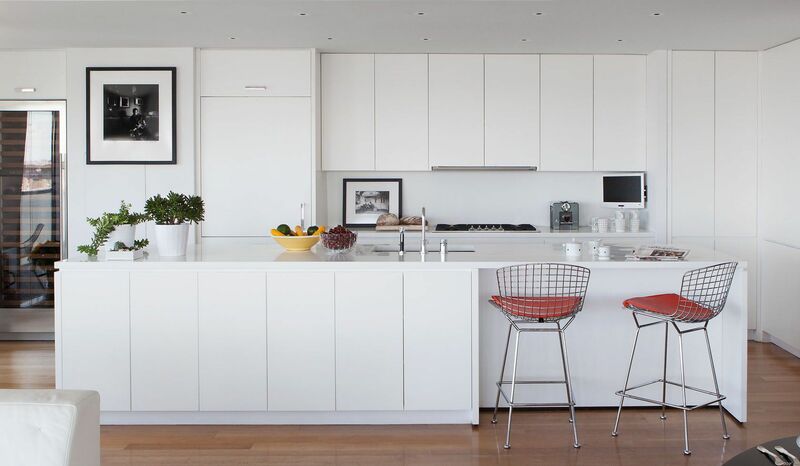 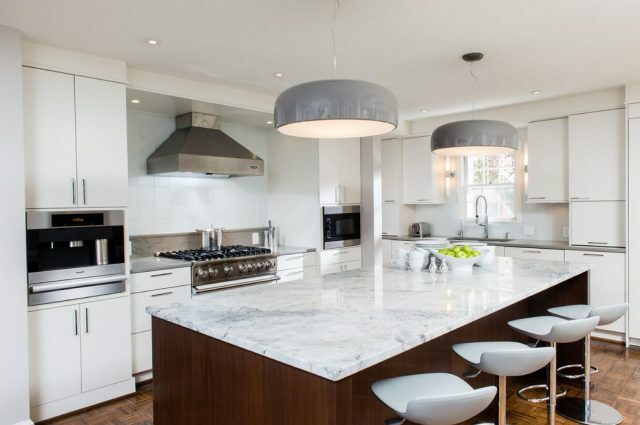 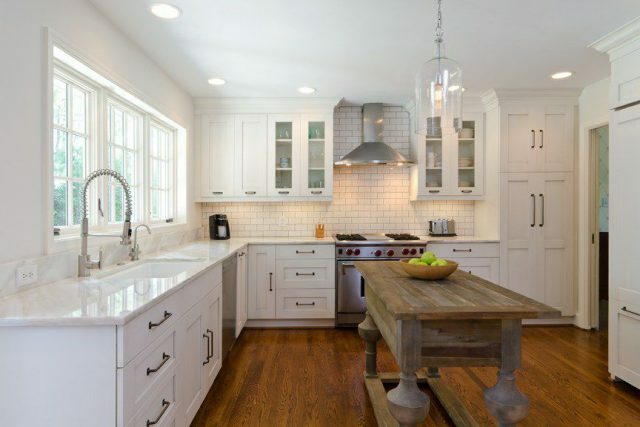 Bar stools or chairs located near the kitchen island can be also of white color. If a kitchen is combined with a dining area, then the dining room can also be designed in a light color scheme. 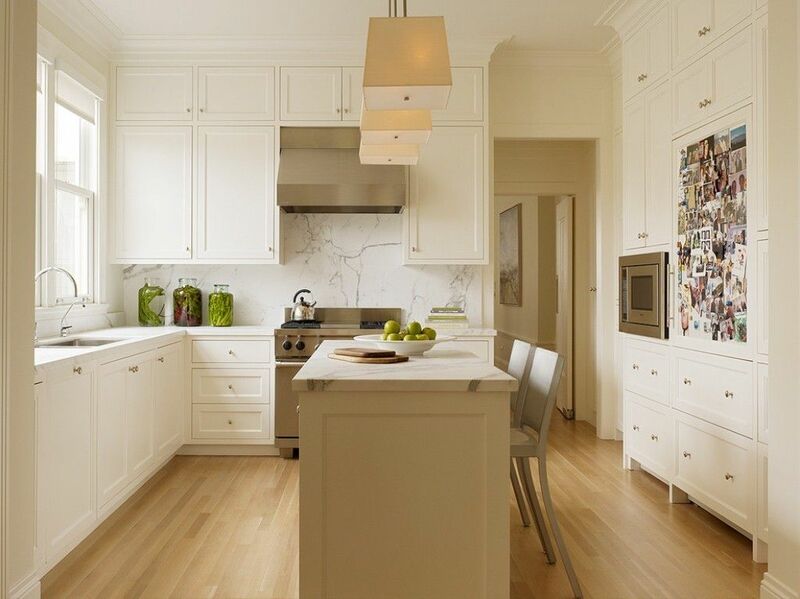 This is an example of a dining group made in white tones from a well-known design family. 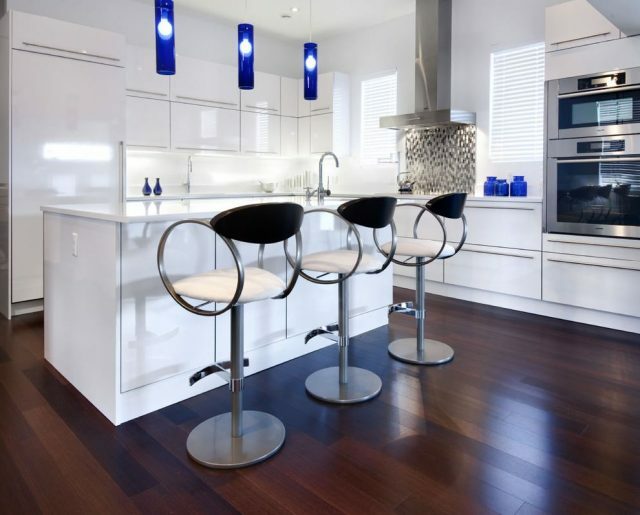 Such furniture will always be popular and, of course, will perfectly fit into the light interior of modern kitchen. The white kitchen island accompanied with chairs of the same shade looks even bigger than it really is. 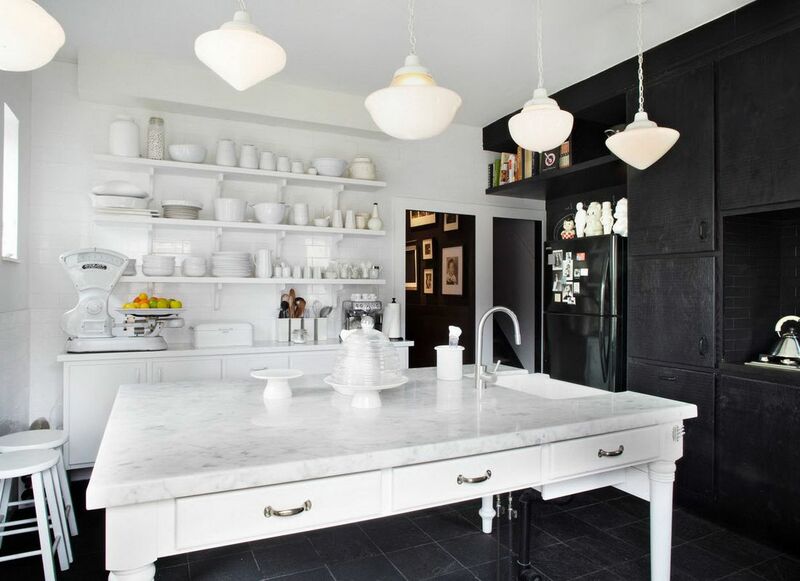 The most classic of all traditional contrasts is the combination of black and white colors within one interior. 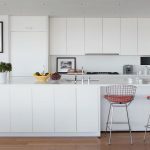 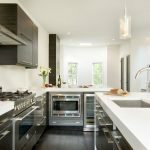 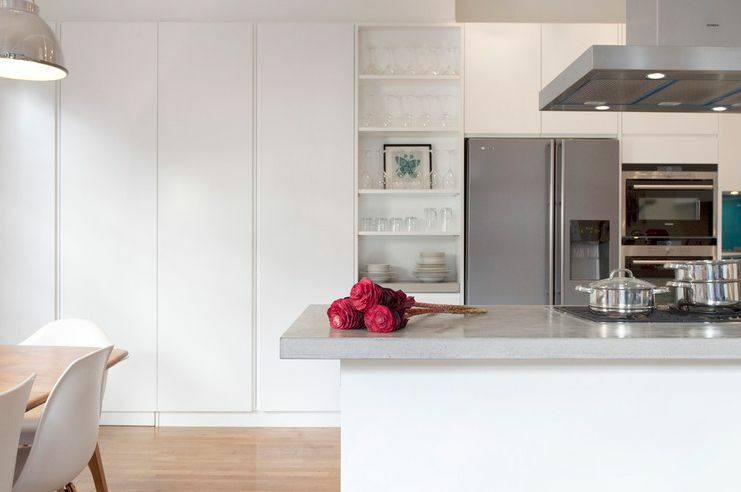 Here are examples of how you can fit two radically different interiors into a modern kitchen design and create a comfortable and non-trivial atmosphere in the room. The black system of kitchen cabinets, refrigerator of the same toneare contrasted with white open shelves and countertops made of light marble. This design is difficult to forget and to call trivial, it is very individual and unusual. 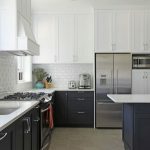 This black and white tile looks great in the classic kitchen, especially if the home appliances are made in retro style. 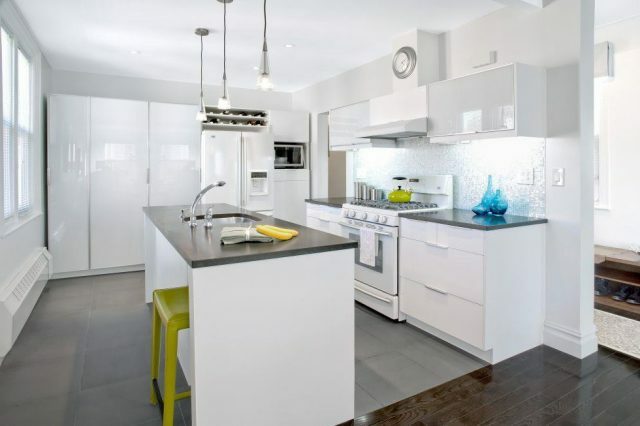 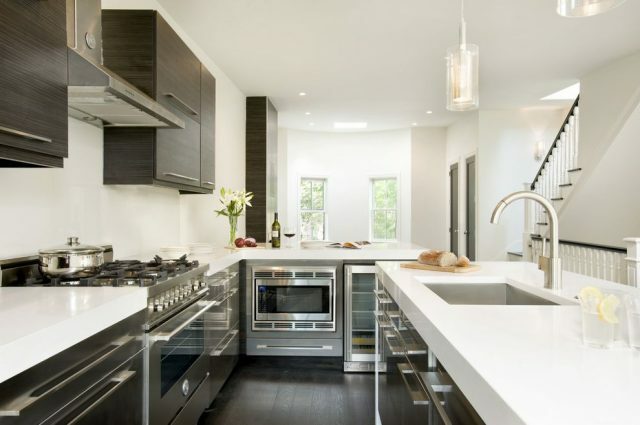 It is often impossible to find a splashback withthe black glossy surface with white kitchen cabinets on the background. 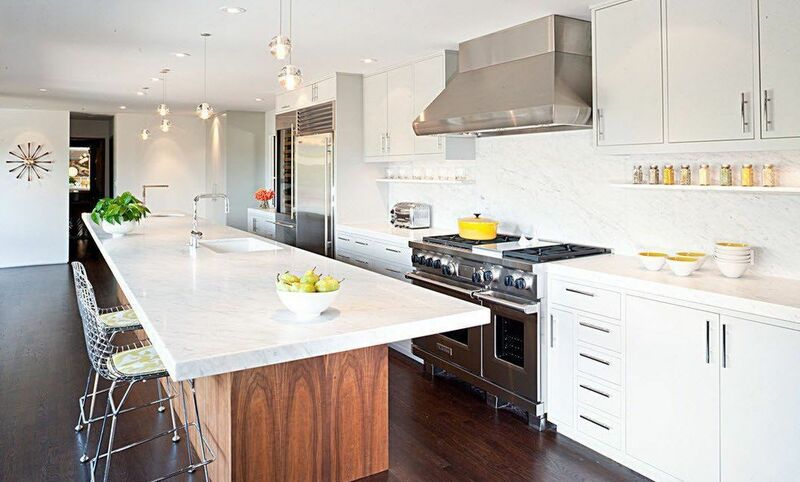 The contrast and dynamic design of the kitchen is truly non-trivial. 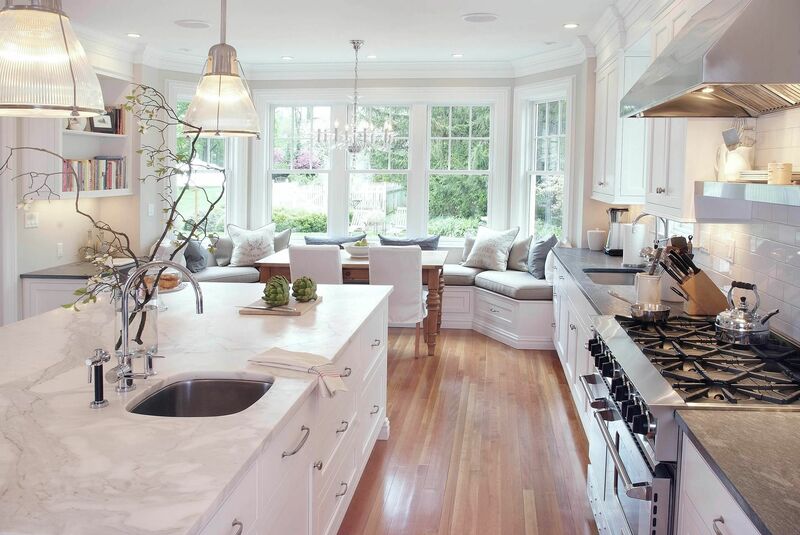 The abundance of light, white finishing makes a room clean and fresh. 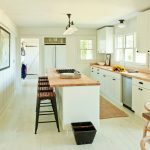 To make an interior warmer you can use the wood, special ways of finishing, as well as raw materials for furniture or kitchen accessories. 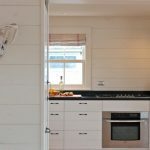 The most obvious and quite practical way of introducing woody shades into a snow-white interior is to coat the flooring with laminate or wood panels. 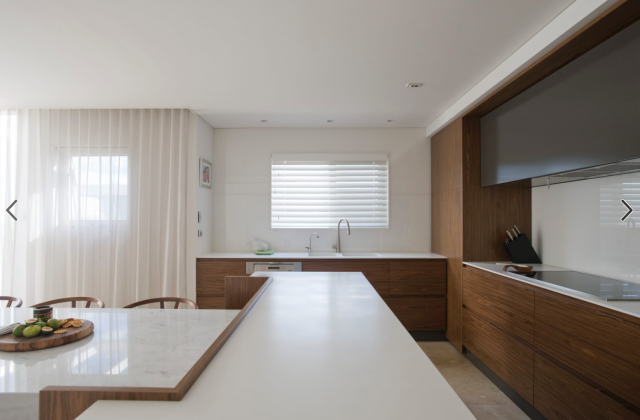 In this interior, the wood motives can be combined with roll curtains made of bamboo raw materials. 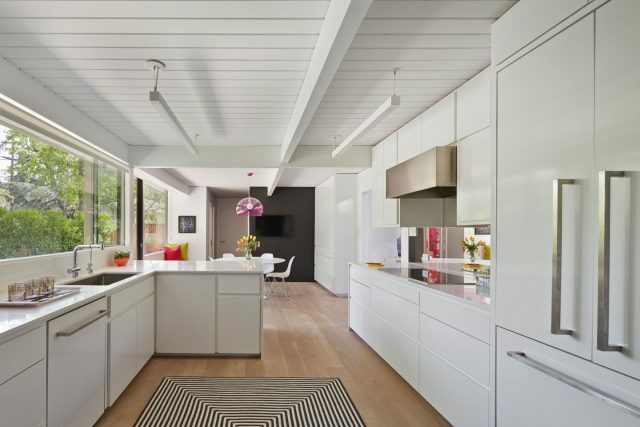 In this light kitchen the wood was used quite actively – a bleached version of wood was used for furniture and the screen wall, while the open shelves are made of dark wood and the dining group was partially made of light-colored natural material. 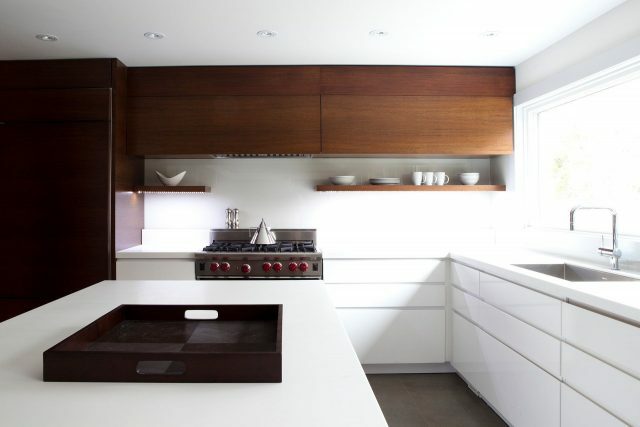 Wood can be usedas a material for a kitchen island or its countertop. 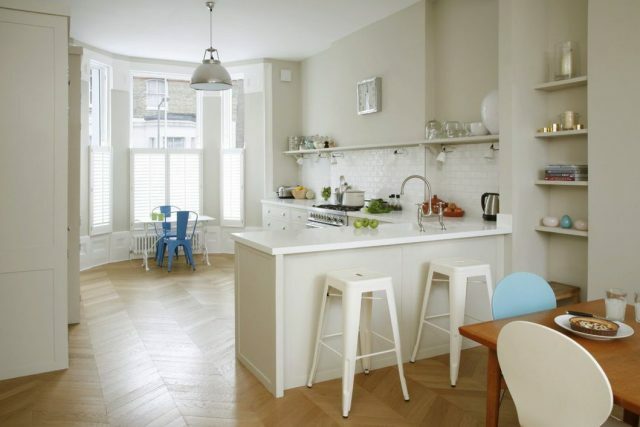 Wooden parquet in the kitchen – why not? 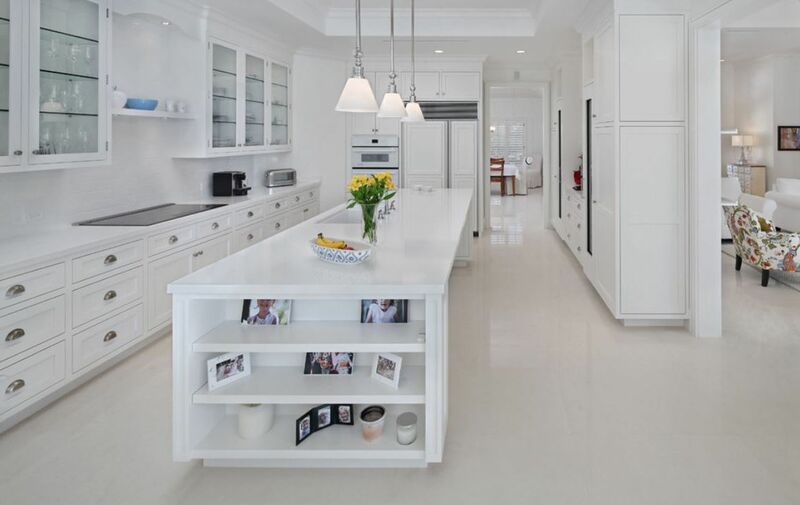 Now there is a large number of special coatings forfloors made of natural material, which protect the surface not only from excessive moisture, but also from dust. 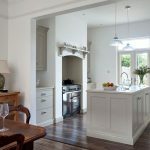 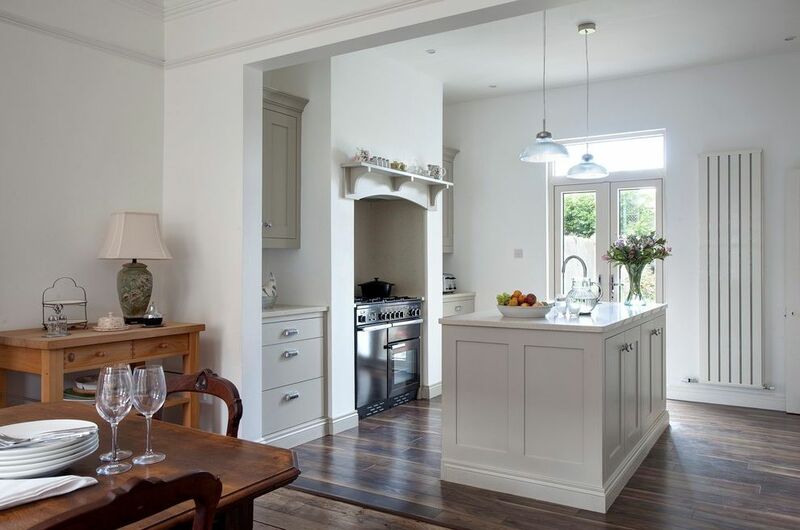 Wooden country style elements perfectly fit into traditional classical kitchens. 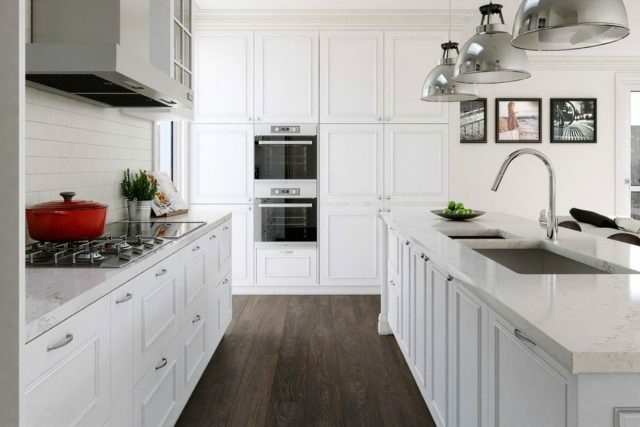 Part of kitchen cabinets made of wood will contrast with a snow-white finishing background, adding not only color, but alsobreaking the uniformity of a kitchen interior. Sand-beige shades of wood is a warming element of this bright kitchen. 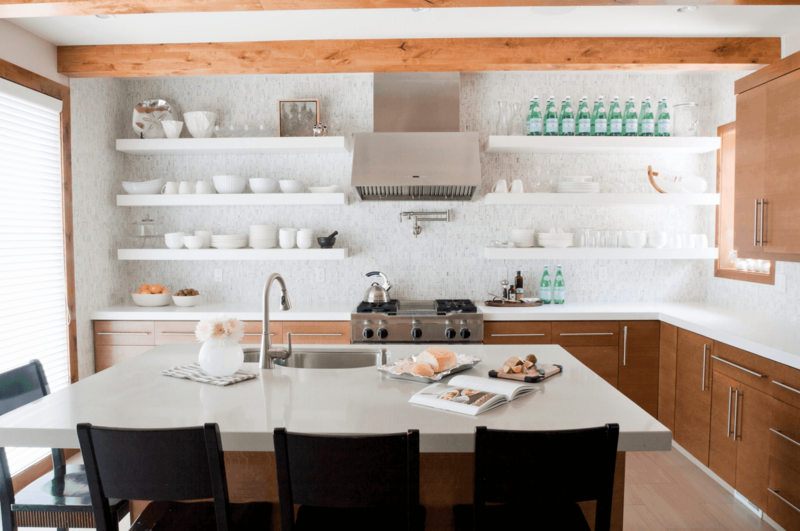 Decorated with mosaic tiles the splashbackis perfectly fit into the monochrome palette of the room. Too light kitchen decor along witha snow-white furnishing tires the view, our vision needs focusing on dark, bright details: chairs, lamps, splashbacks or even dishes that shouldn’t be hidden in the cupboard. 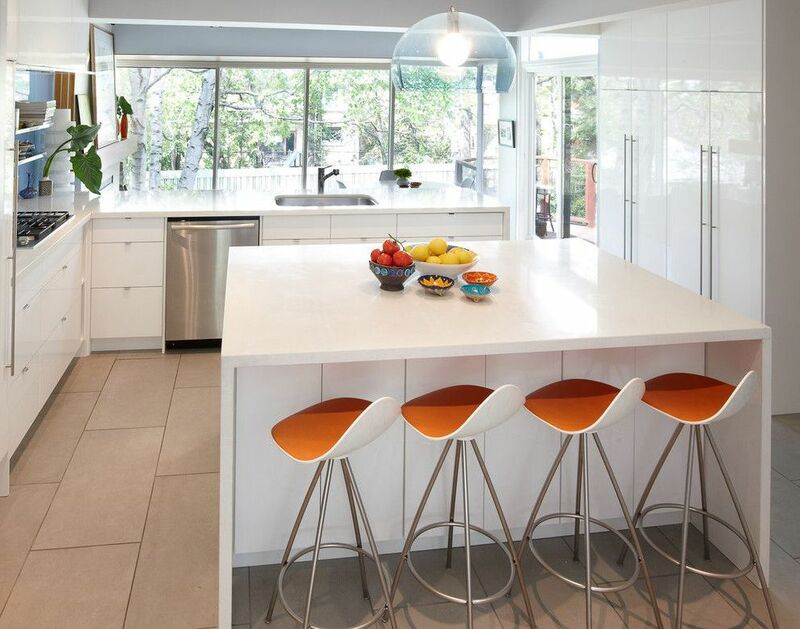 The bright, juicy orange color on the bar stools brings an atmosphere of spring and warmth to the kitchen. 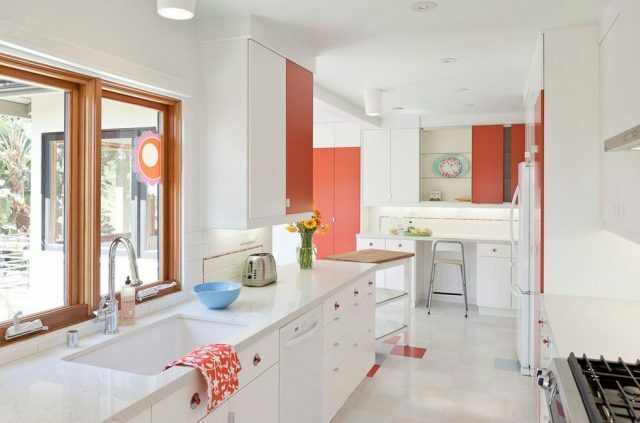 The crimson tone has become a perfect addition tothe small white kitchen, pieces of furniture and elements on the floor are very attractive. 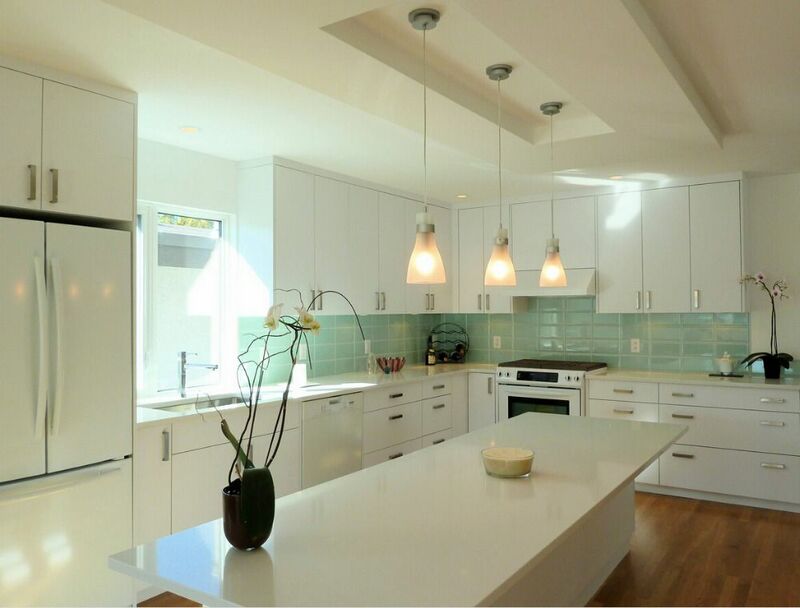 The light mint color of glossy tile on the splashback has become the focus of attention in this snow-white kitchen. Another example of saturated bright color on the splashback. 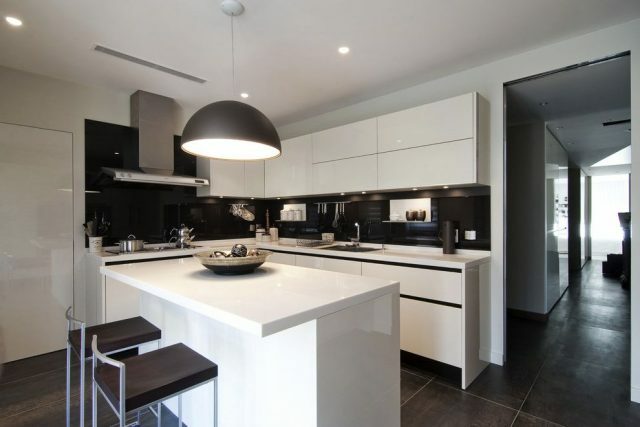 The white-black-red interior looks intriguing, modern and practical. 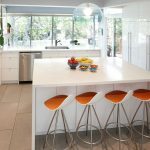 There are a lot of bright accents in this ultramodern kitchen – original pendant lamps of bright indigo color, bar stools of an unusual design and a shiny finishing of the splashback. 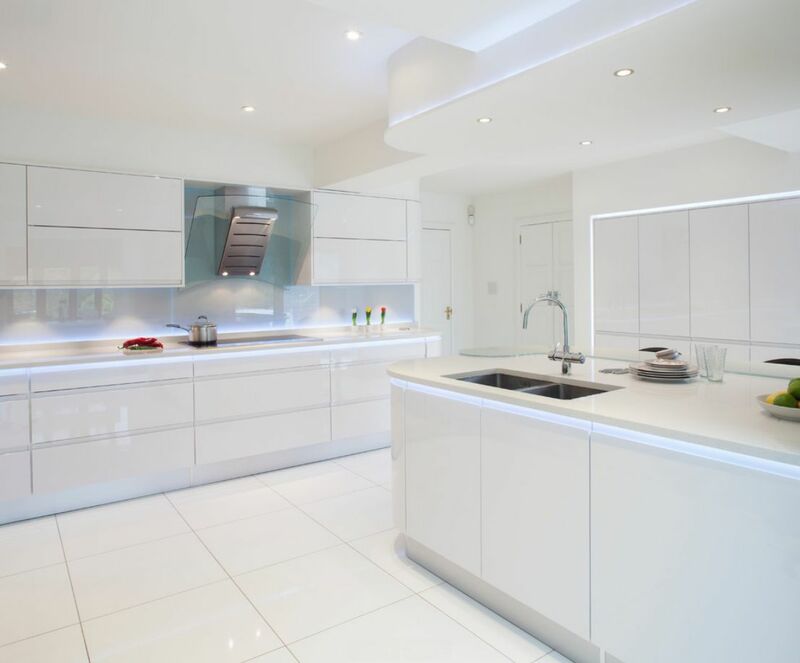 A light finishing is not only preferable for small kitchens, but it is sometimes the only possible option for visualincreasing of the room. 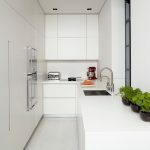 This compact kitchen set occupies very little space.It includes all necessary household appliances and storage systems, looks modern and fresh, thanks to the light walls and white table tops. For this small kitchen with classic kitchen cabinets, dark colored floors and mirror surfaces of household appliances and pendant lamps have become a perfect addition. 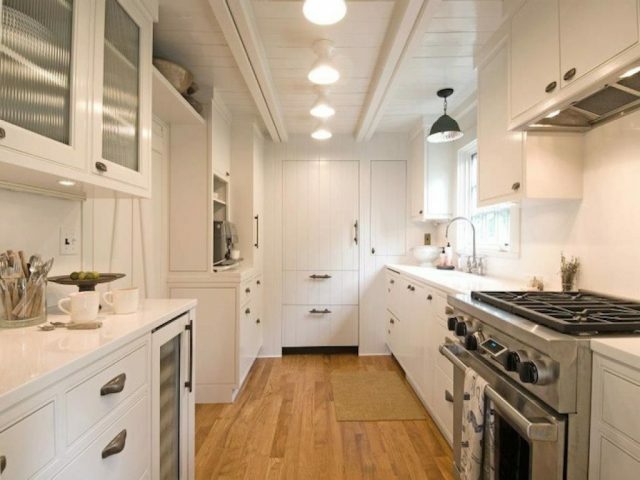 When a kitchen is too tiny, the white color is used both for finishing and for making furniture. 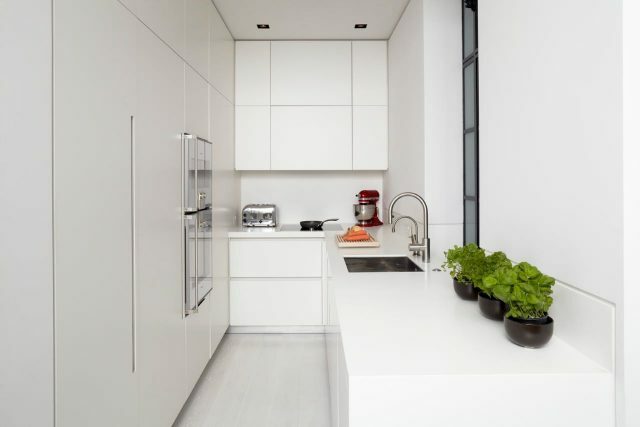 To make the kitchen brighter you can use household appliances, accessories or plants. Milk shade of a small classic kitchen has become a good design solution. 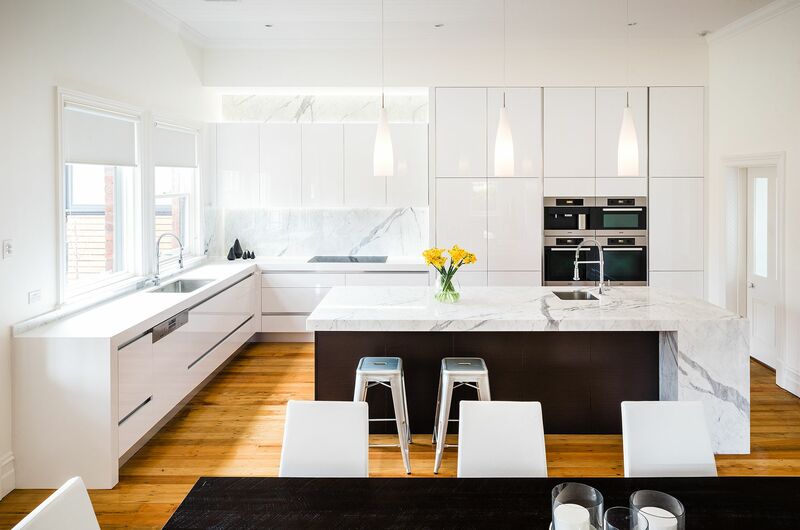 In combination with the marble splashback, the kitchen looks luxurious. Another example of a small kitchen, organized in a narrow and long room. 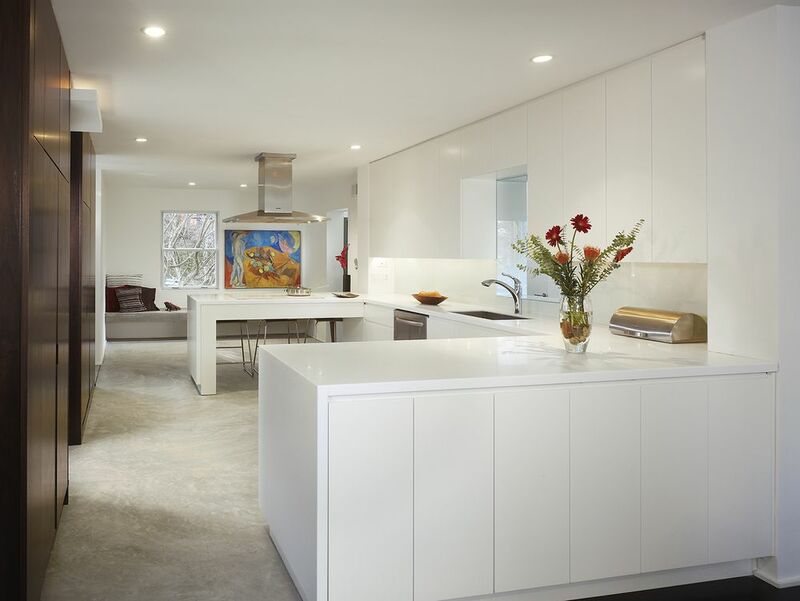 The interior does not seem cramped due to the light finishing, several levels of lighting and the ergonomic arrangement of work surfaces and household appliances. 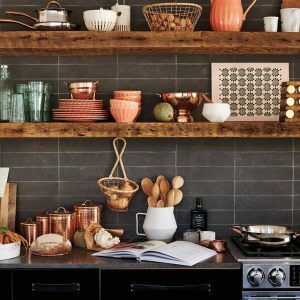 Copyright © 2019 Garden and Home.